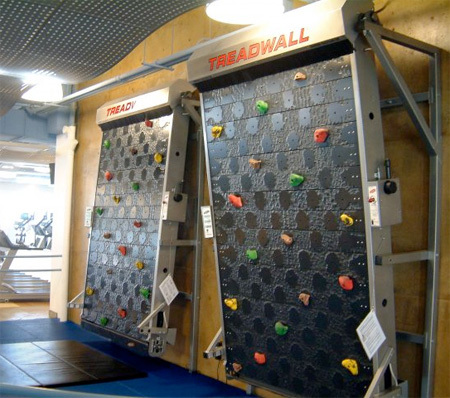 Rotating climbing wall designed by Brewers Ledge allows people to climb without stopping for as long as they want. 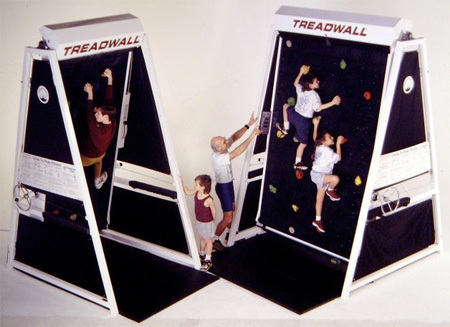 Innovative Treadwall is a combination of a treadmill and a climbing wall. 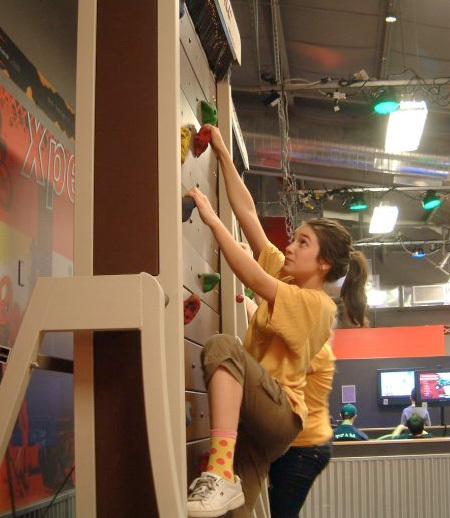 Experienced climbers can change the angle of the wall, speed of rotation, and position of hand grips. Available in two configurations: wall-mountable or freestanding. No more fear of heights. I want to climb it. Great! 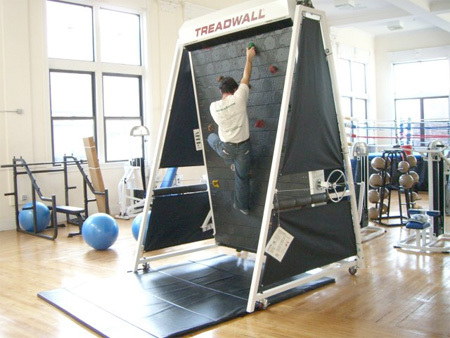 all the fun of a workout, without any of the feeling of accomplishment. 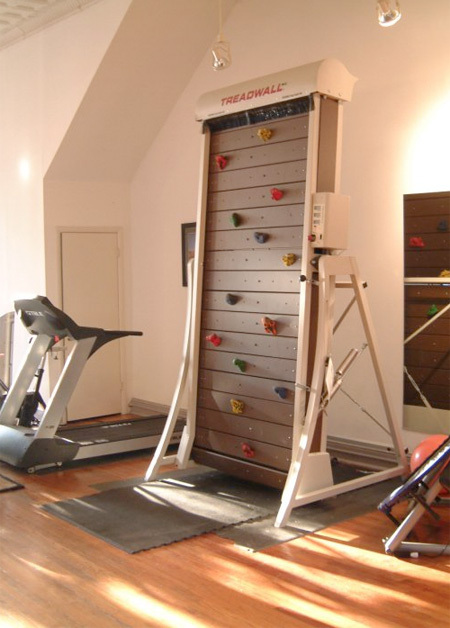 I’ll take my real rocks and climbing walls over this any day. it is very very wonderful. Thats awesome. i hope it comes to gim in my country! 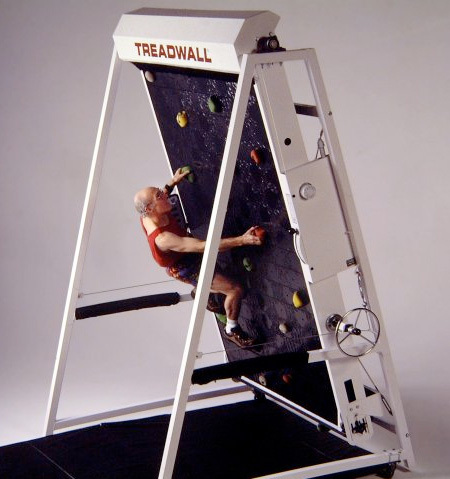 I think it’s a shame that it’s motorised, I’m sure one could be engineered that works using the person’s bodyweight to drag down the wall. It’s very wasteful to drive to a gym and use motorised things like a treadmill. Run outside instead! I can understand why someone would rather climb on this instead of a wall (our an outside rock face), but it’s a waste of electricity. This has been at my local gym for at least 2 years. I figured there everywhere by now. Great for competition because there’s two side by side. It’s not about having fun, it’s about exercising yourself in an innovative way. Actually, to make one work on gravity it would have to have several gears specific to body weight which would be both an engineering nightmare AND not cost effective. Just for the record, there are lots of places like Michigan where I live that jogging outside is NOT something you can do year round. We call it snow here and it’s bloody hard to jog through if someone has not shoveled their walk yet. Perhaps Ru, you live in a state or country that does not get extreme winter weather like we do here but not everyone lives where you live of course and these sorts of things are invented for those of us snow bound for several months of the year. I spy with my little eye, Comic Sans!!! Anyway, this looks like fun! Gert, I live in Northern Europe. We get some pretty bad weather. If it’s snowing, you just wrap up and go for a shorter jog, or you play with the snow to burn calories. Then again, I’m not daft enough to live in the suburbs where the government doesn’t clear the pathways and make it safe in winter. 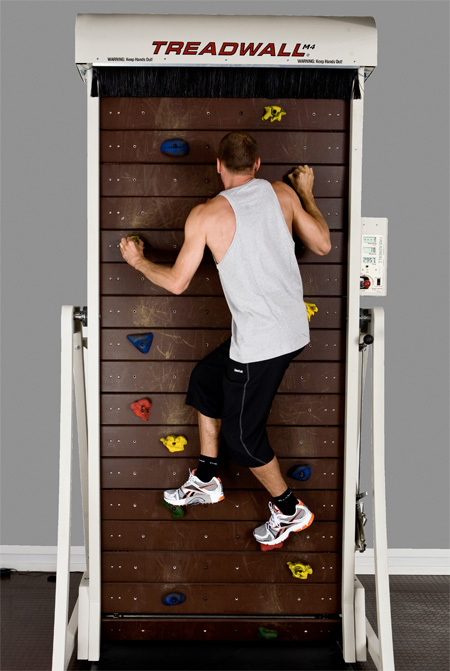 They do have one that works on body weight. The exact same brand to be exact. I used it while I stationed at Ft Chaffee AR. You used the selection switch on the side to change the resistance on it. Now obivously some people where to heavy/light to make it go that oh so special “just the right” speed. For the most part all the guys and gals in my unit loved it though. It also had such wonderful Colourful rocks, had to throw that one in there seeing as how you said your where from Europe and all..Anyways, Cheers mates and happy climbing. And for the dude who said it’s a waste of electricity – you were using a computer to write that, why weren’t you just happy using papers and pencils? You’re wasting electricity expressing your opinion, are you not? 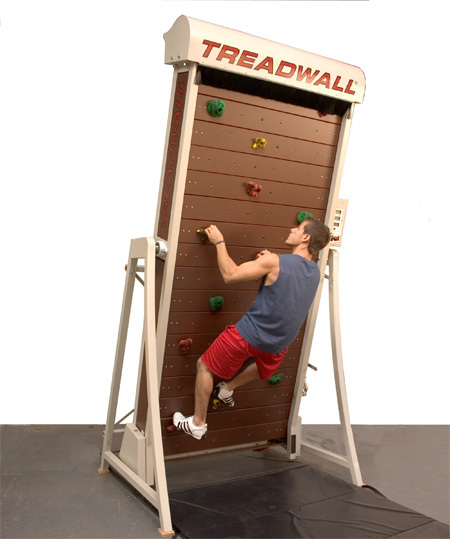 I disagree that it’s a waste of electricity to use one of these treadwalls. I have difficulty running outdoors since I do not have 3D vision due to very poor eyesight. I might run into people, hurt my ankle on an uneven ground, or run into an obstacle. I also don’t want to risk my safety by climbing real rocks. This is perfect for someone like me, and for many others who have perfect vision. This is a very smart device.